Venue: Rm 104 XinZhai (新斋), Tsinghua University, Beijing. The main theme of the workshop is to investigate how modern formal logic and early analytic philosophy have been perceived in terms of the characteristic features of modernity (individualism, scientism, essentialism) and modernism (contextualism, autonomy, self-referentiality) in China and in the West. The advent of modern formal logic and the first stages of analytic philosophy have coincided with the blossoming of modernity in the nineteenth century and with the rise of modernism in the early twentieth century. In China and in the West these developments took on specific forms, due to differences in political, social, cultural and economic factors. 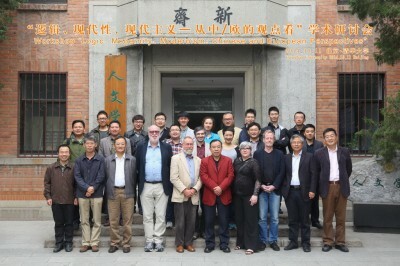 The aim of the workshop is to investigate in detail how modern formal logic and early analytic philosophy have been perceived in China and in the West in relation to modernity and modernism in a wider socio-cultural and politico-economic setting, and how these perceptions have influenced and shaped their acceptance, both in the academic world, e.g. as independent subjects in the academic curriculum, as well as on a broader scale, as cultural and/or political influences. The main goal of the workshop is to bring together Chinese and Western scholars with an interest in these issues, to compare views and results of earlier research on specific topics in this broader area. As there has been hardly any substantial comparative research on the main theme of the workshop, the goal is is first of all that of exchange of results and insights in the Chinese and the Western case, respectively. The secondary goal is to investigate during the workshop the possibilities of setting up a more systematic comparative study, and outlining a programme that could be executed as a follow up of the workshop. In order to facilitate exchange and discussion as much as possible, the programme of the workshop will also make ample room for moderated discussions and informal exchanges, in addition to formal presentations of existing research results. Thus, the idea is to take the notion of a “workshop” seriously and have the participants really work together on their common interests, which also means that they attend the full two days of the workshop. To this end, participation in the workshop will be limited: besides the speakers we aim to selects some 10 to 15 additional participants who will be expected to attend the whole workshop and to contribute to the discussions and exchanges.